SETAF has grown into the largest (as a matter of fact maybe the only) US Army Command in Europe today. Currently the CG (MG Jason Kamiya) with his staff and the entire 173d Airborne Brigade are in Afghanistan and they are to be back next spring. Right now at Ederle MG David T. Zabecki is “CG USASETAF Rear (ABN) (Provisional), and a full Colonel with his Staff are running the 22nd Area Support Group. MG Zabecki is a history buff and he was very surprised to see that at Ederle there are scanty (if any at all) files of SETAF’s early days. Although I’ve been in retirement since March 1998 I have always kept in very close contact with the SETAF Hqs Staff. MG Zabecki is interested in a short range and long range project. -- First of all we are working on a program to celebrate SETAF’s 50th anniversary on 25 October. It will not be much of a military event, unfortunately, as there are very few Soldiers here for a memorable parade. Nevertheless, we are working on the Community Relations aspect and we’ll invite former Mayors and Italian Army Unit Commanders with whom we worked so closely for training purposes as you remember very well. 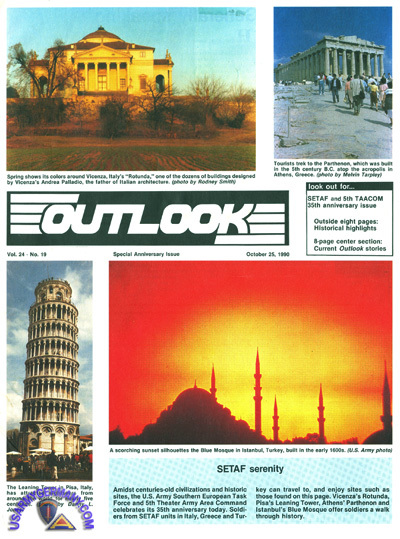 Part of the 50th anniversary program is to put together some kind of display highlighting important military and Public Relations events which occurred in SETAF’s early years. I have several photos on hand and copies of press releases which I wrote for the Italian media which will be helpful for that purpose. -- For the long range project we are working at setting up a permanent display at Ederle with as much historical documentation as possible, mainly photographic. Besides being able to provide quite a bit of material in possession, I have contacted LTG (retired) Bob Coffin who was in SETAF in the very early years, first as G3 and then as Commander of the 1st Missile Command. He is sending some photos and excerpts from his personal memoirs. Others whom I have contacted are all of the former CG’s whom I workd for and with whom I’ve kept in touch over the years, as well as former Unit Commanders like Col. Bielefeld with his 159th Rocket Bn old timers, and Col. Crenshaw. All are sharing memories and photos with us. I have been unable to contact other old timers like Col. Gude, Col. Land and other Corporal and Sergeant Missile Unit Commanders, for that very same purpose. We need some help in getting in touch with some of those Gentlemen, and also in supporting our project with materials and memorabilia from your personal collections that you would like to share with us. We would be very grateful. Anyone who can provide information, materials, suggestions or has questions about the projects, please contact Phil Maselli directly or the webmaster. On Sept 29, 1955 the first contingent of USFA combat troops (214 officers and men of 1st Battalion, 350th Infantry Regiment) left Austria via the Brenner Pass (in a 50-vehicle convoy) on their way to Vicenza in Italy, their new home station. 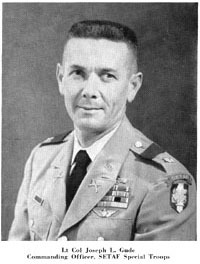 Lt Col William D. Hawke, Bn CO, led the convoy. The convoy left Camp Roeder on Sept 28 and stopped at Camp Rum in Innsbruck, Austria, where it stayed overnight. Brig Gen John H. Michaelis is located at Vicenza and currently is setting up a new command, the Southern European Task Force (SETAF), which will be under the control of AFSOUTH. SETAF marks a radical departure in military strategy -- it will be a small American strike force (about 5,500 men) equipped with the most modern (atomic) weapons. The first U.S. Army units have arrived in Verona, the vanguard of about 1,000 American soldiers that will be stationed here as part of a small but potent defense force in northern Italy following the neutralization of Austria. The Verona contingent will be commanded by Lt Col Chalmers R. Wilson, of Columbus, Ga. The 66th Ord Co and the 7646th Medical Detachment, about 180 men in all, rolled in from Austria via the Brenner Pass. Eventually there will be about 5,500 men in the U.S. contingent, forming the new Southern European Task Force (SETAF). Infantry and artillery units have already been moved from Austria into the nearby city of Vicenza. USFA was officially redesignated the Southern European Task Force (SETAF) in impressive ceremonies held at Ederle Casern, Vicenza, on Oct 25. The new command, designed to beef up Western defenses in Italy is under the command of Brig Gen John H. Michaelis. SETAF came into existence following the withdrawal of four-power troops from Austria earlier this month. The American troops moved into Germany and Italy. Troops taking part in the ceremony today included the 1st Bn of the 350th Inf Regt and attached units, the 85th FA Btry with Honest John rockets on display; and a composite unit of the Italian Army made up of a heavy artillery unit, an infantry unit, Alpini (mountain troops), and the Garibaldi Italian Army band. The U.S. 49th Army Band, famed for its playing at the changing of the guard in Vienna in the post-war years, also took part. Dignitaries attending included: Lt Gen Clemente Primieri, CG, Southern European Forces; Bishop Carlo Zinato, of Vicenza; Lt Gen Alberto Aliberti, CG, Italian. 3d Army; Lt Gen Frederico Moro, CG, Italian IV Army Corps; and Lt Gen Edmondo de Renzi, CG, Italian V Army Corps. After an invocation given by U.S. Army Chaplain (Maj) John Rettagliata in English and Italian, Lt Col Willard W. Havvke, CO of the 1st Bn, 350th Inf Regt, and commander of troops for the ceremony gave the command to "publish the orders." 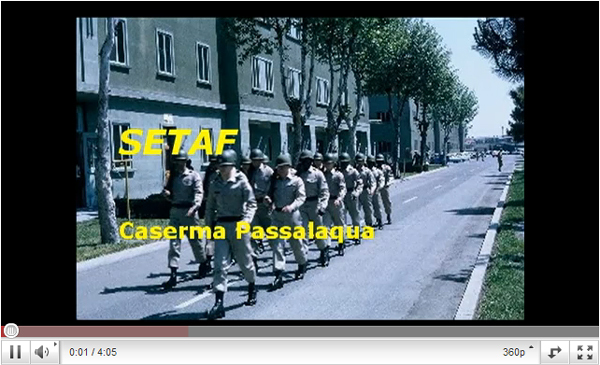 SETAF HQ moved from Camp Darby, Livorno, to Caserma Passalaqua in Verona in May 1956. The Headquarters officially opened at Verona on May 21. Making the move with HQ SETAF were the SETAF Army Band and the 68th Military Police Company. The move will affect only a few (those working for SETAF HQ) of the 3,000 Italian employees at Camp Darby. Most of the Italians are employed by SETAF Support Command which will remain in Livorno. With the scheduled "phaseout" of US Forces in Austria (USFA) in late 1955, plans were initiated in early 1955 to create a new military command in Northern Italy as a defensive force to fill the breach caused by the withdrawal of troops from Austria. Thus, the Southern European Task Force was activated in October 1955 initially staffed with troops arriving from the former USFA command in Europe. SETAF is a theater of operations and has full command powers. The command is an integral part of the land forces component of AFSOUTH. It functions under the command of Italian Army General Clemente Primieri, CG LANDSOUTH. MISSION of the command: (1) (wartime) to provide (atomic fire) support to NATO land forces in Northern Italy; (2) (peacetime) to help promote the American way of life by means of the daily activity and contact with friendly foreign nationals. With the activation ceremonies held at Camp (Caserma) Ederle in Vicenza on October 25, 1955, the Army began the formation process of a prototype "new US Army command," a flexible and mobile atomic task force that would reflect the newer concepts of Army organization geared to the modern nuclear battlefield -- small, but with enormous striking power, self-sufficient and self-sustaining. As mentioned above, the first troops to be assigned to SETAF in 1955 came from the US Forces in Austria which was disbanding at the time. They were sent to Camp Darby at Livorno, Italy. Camp Darby served as home station for HQ SETAF for a short period until the headquarters moved to Camp (Caserma) Passalaqua in Verona (May 1956). SETAF has only a few installations in Northern Italy: Livorno -- Camp Darby; the Port of Embarkation, Leghorn; and the Army Depot at Livorno; Verona -- Camp Passalaqua with a nearby Army Airfield at Boscomantico; Vicenza -- Camp Ederle. Both Caserma Passalaqua and Caserma Ederle are former Italian installations that have remained unused for years before being handed over to the US Army. Significant reconstruction and rehabilitation work is underway at both installations as Army personnel and their dependents have to "rough it" at the two posts. Rehabilitation efforts -- the first phase of the building program -- include reconstructing, renovating and rebuilding existing structures at the installations as well as building new streets. Phase two -- not to start until the rehabilitation phase is completed -- will include construction of new barracks, shops, etc. 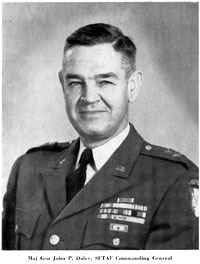 First commanding general of SETAF was Brig Gen John H. (Iron Mike) Michaelis. He would be succeeded by Maj Gen Harvey Fisher. One of the units assigned to SETAF in the early days was the 85th Field Artillery Battery (Honest John) which arrived from Germany. The 350th Inf Regt (formerly with USFA) was inactivated; personnel and equipment were organized into two armored infantry battalions -- the 52nd AIB and the 58th AIB. Two tactical headquarters were established -- Task Force A and Task Force B; both at Camp Ederle. SETAF HQ remained in Verona. The 28th Sta Hosp at Livorno was reorganized and redesignated as the 45th Fld Hosp. The 202nd Trans Co (Lt Hel) was activated as the Army aviation support unit for SETAF. Some minor units were inactivated or redesignated; other smaller units were created. I just ran across your website. 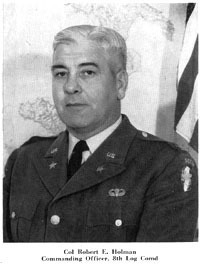 My father Maj. Paul L. Beckman, was on the founding staff of Headquarters SETAF. We were stationed at Caserma Passalacqua from December 1956 until June of 1959. My father was the Special Service Officer and both Rec sites at Lago de Garda came under him. I remember spending many a summer day at the officer's Beach Club. Because we did not have concurrent travel my Mom, two brothers and I followed after Dad was able to find an apartment for us to live in. We spent our first Italian Christmas in the Albergo Firenze because the apartment was so new it wasn't completely finished yet! At the time the DOD school was in an old converted paint factory. I went there for a couple of months until a Catholic school was opened up for the Americans. I believe Father Pelitier, our military chaplain was instrumental in getting that started. The commanding General of the post was Harvey Fisher and Col. Cohnrad was a close friend of my parents. My Mom and I returned to Verona the summer of 1981 and were able to get an unofficial tour of the post when we told the Italian guard that my father had been stationed there. Nothing had changed. The Officer's club was the cafeteria for what was then the University of Padua and the Chapel were I was Confirmed was still there also as was the movie theater. My son who lives in Athens, Georgia works for a construction company and told me that one of the architects on his job is working for a company that is redoing Passalacqua and the Italians are going to return it to the Americans! I don't know when all this is supposed to take place, but it sounds interesting. The next time I am home I will look through the family photos and see if I can locate any of Verona. I very much enjoyed looking at your web site. Ironically, my husband served under SETAF, from January 1980 through May 1982, but we were stationed in Athens, Greece! My husband went to Vicenza quite often and ran into some Italians who worked in the gym that my father had hired when we were in Italy! Bob Beard used to teach tennis at Passalacqua, but he was at Vicenza and my husband met him. What a small world. My Dad passed away but my mom is still alive. She is the one who has all the photos. It was fun going down memory lane. I will do my best to get some photos for the website. 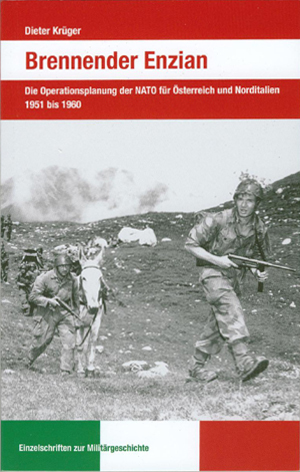 I just (March 2013) received a copy of a German military history book written by Dr. Dieter Krüger who analyses NATO operational planning for the Austria/Northern Italy sector in the 1951 - 1960 time frame. Although I have not yet read the book, I know of other well-researched studies by Dr. Krüger and expect he will cover with great detail the evolution and implementation of emergency defense plans for LANDSOUTH which also involved SETAF and its atomic fire support organization, the 1st Missile Command. I will provide additional details once I have had a chance to review the book in detail. The book is in German. If you have questions, please feel free to contact me (webmaster). "The Army is planning six Atomic Support Forces similar to the one now located in Italy"
This statement, appearing frequently in the news in connection with the defense budget, exemplifies the general trend of military thinking and planning since Korea - a reorganization of forces together with an undiminished maintenance of the Army's world-wide commitments. References to the force in Italy focus attention on an organization that is unique in concept, makeup, and mission - the United States Army Southern European Task Force, known as SETAF. What is SETAF? Primarily, it is a combat-ready atomic-capable support force deployed as part of the NATO defensive elements stationed in Northern Italy. However, due to this unique employment as the first atomic-capable support force operating alone in a foreign country, it has been cast in a much larger mold. Developing the organization, tactics, and techniques of a U.S. Army missile command. Performing the numerous housekeeping, administrative, and logistical functions normally associated with a Theater Army Command. Creating and preserving a feeling of fellowship and mutual respect with its partners in NATO, the Italian people. SETAF is a young and vigorous command, unhampered by traditional methods and outmoded ideas. Organized in October 1955 from elements made excess by the phase-out in Austria, it immediately undertook an entirely different role. No longer was it a portion of a large command dealing with a well-established occupation mission. It now was confronted with an artillery support role to include an atomic capability. Transformation of this relatively unorganized force into an effective atomic backup element required the best efforts of all concerned. Addition of an atomic capability to the vital Italian defenses in the Alps was urgently needed. Organizationally, SETAF has always consisted of three essential elements - a combat force, a logistical support echelon, and an overall command headquarters. Initially, the combat element consisted of a reduced Infantry regiment supported by an Honest John battery and an Engineer company. This organization was essentially a modernized version of the Regimental Combat Team that had rendered such outstanding service in World War II and Korea. In preparation for warfare in the atomic age, complete revamping was necessary. Likewise, the Infantry-heavy posture had to give way to greater emphasis on the missile and rocket units. The area of employment is wide and in order to provide adequate support for the entire Italian front, every man must contribute directly toward placing the rockets and missiles on the enemy position. Accordingly Honest John and Engineer element were expanded, Corporal units were added, and the Infantry strength was reduced. Each step was carefully tested and studied for strengths and weaknesses in order to define properly the next step. Repeated field exercises in various terrain, weather, and tactical situations dictated the necessary organizational changes. Despite the difficulties of deployment, training, organizing, and reorganizing, SETAF maintained its combat readiness throughout all this developmental period. In the process of revising the organization, SETAF learned many tactical leassons. In a missile support force, there must be a fusion of tactical and logistical elements unheard of in former days. Ordnance support is required to be in the "hip pocket" of missile units. Signal communications in the many functions of target acquisition, command, and control must be coordinated exactly. Wheras in SETAF Infantry mass is a luxury that cannot be afforded, the missile artillery in the wide open warfare of tomorrow's "no front line" battlefield must have close-in Infantry protection responsive to its mobility and multifarious employment or it will be destroyed. Many other equally important tactical principles are constantly being brought to light. Throughout its existence, SETAF has stringently resisted all temptations to become large, cumbersome, or immobile. To create each new organization a fixed overall manning level has been maintained. Spaces have been taken away from marginally productive areas in order to create vitally needed elements. Each change has been dictated by the necessity for tailoring the unit to perform the task of providing missile support, with an atomic capability, while operating alone in a foreign country. In keeping with these objectives, the normal Missile Artillery Rocket Group Headquarters was eliminated and its function added to those of the Missile Command Headquarters. The three Infantry companies provided as security elements for the fire units have been made an integral part of the artillery battalions they protect. Likewise, the Italian Army has assisted materially in the efforts to eliminate nonessential tasks in order to enhance SETAF's capability as an artillery command. Italian Army units cooperate with SETAF in many ways, such as providing additional security for isolated elements and protection for the line of communications. The spaces saved by these measures have made possible the organization of a Sky Cavalry Battalion which has been assigned the vital target acquisition mission. SETAF's line of communications starts in Livorno, extends northward over the Apennine Mountains and across the Po Valley 220 miles to the Headquarters at Verona. From there it extends forward an additional 32 miles to Vicenza where the majority of the units that make up SETAF's combat power are located. Practicalities of distance, available communications, and facilities have dictated in some degree the location of the various units. The port of entry is at Livorno; the Headquarters of the NATO Commander who exercises operational command over SETAF is in Verona; and the combat deployment areas are north and east of Verona where the gaps and passes in the Alps have formed the historic invasion routes into Italy. As a result of the evolution and experimentation SETAF today consists of a Logistical Command (Missile) located at Livorno, with forward supply responsibilities in the Verona and Vicenza areas; SETAF Headquarters located at Verona; and the First U.S. Army Missile Command located at Vicenza. This deployment affords SETAF a framework from which to employ its devastating power in any future war. Likewise, lessons learned in its day-to-day operation as an atomic-capable support force should contribute materially toward the further development of Army doctrine for atomic age warfare. As stated previously, SETAF assumed expanded proportions due to functioning in large measure as a miniature Theater Army Command. As the sole United States land force in Italy, it has only itself to rely upon for all the activities and support normally provided by the theater command, such as ports, depots, posts, hospitals, dependent schools, and numerous other logistical and administrative functions. These activities, though individually small, correspond numerically and in variety with the functions of any major theater of operations. In accomplishing these administrative tasks, SETAF has lived within an austere manpower ceiling. This has complicated the task to a degree. However, by combining functions and minimizing the effect of distance through the employment of rapid means of transportation, efficiency has been achieved. At the same time, capability has been retained for rapid expansion, in the event of sudden war, to a theater of operations of any sze that may be required. An additional problem of great concern to SETAF has been the complete absence of adequate training areas for the accomplishment of an effective training program. Italy is a country of great population density and an extreme shortage of arable terrain. A training installation of the Fort Benning, Sill, or Bliss variety is unobtainable. Troops are billeted in small compact "casermas" located in the outskirts of sizable towns. These installations barely provide the essentials for housing and living. Any training, even small unit problems, conditioning marches, and small arms firing, is accomplished with great difficulty. 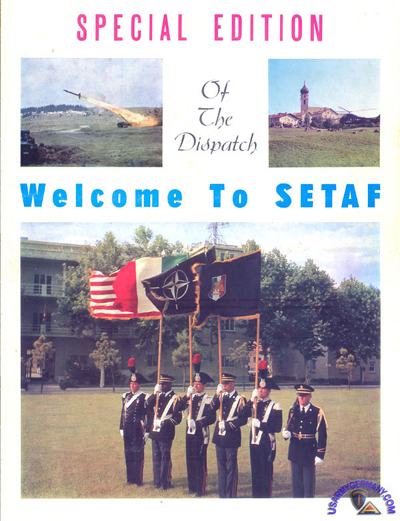 Despite all obstacles, SETAF has always retained a high degree of immediate combat readiness. This has been done by adopting the methods used by the Italian Army. Suitable terrain is legally borrowed from its private owners for a training exercise or maneuver. 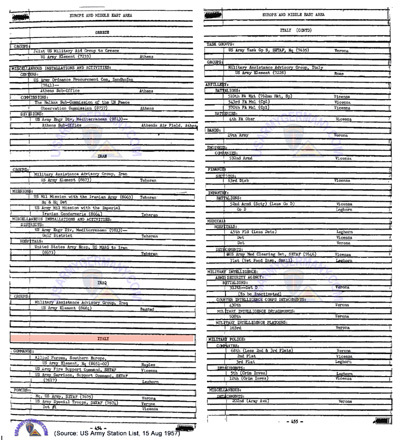 Safety zones and other precautions are established according to normal U.S. Army practice. As necessary, and assisted by the Italian Army, the local inhabitants are removed from their homes and farms for the duration of the exercise. After completion of the maneuver, a joint Italian-United States claim team moves in to settle immediately for any damage inflicted. This method has made possible successful range practice and firing exercises for all weapons up to and including the Honest John rockets. The Italian setting has been responsible for another serious training challenge. Cities and roads stemming from the ancient civilization and culture of Italy are not designed for modern, high speed, mechanized traffic. The quaint, narrow streets, the steep mountain defiles, and numerous scooters, bicycles and carts make a hazardous setting for the oversized military vehicles of today and tomorrow. By careful driver selection and training, and constant command emphasis on safe road practices, the SETAF accident rate has been kept very low. SETAF is not an occupational force. It entered Italy long after the peace treaty ending World War II was signed. The Italian nation is a sovereign and co-equal nation with the United States and the other members of the North Atlantic Treaty Organization. 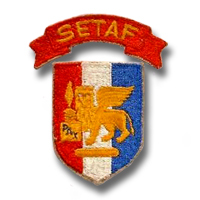 SETAF came to Italy as an invited foreign force. Italian officials readily admitted that the re-entry of the Americans was cause for some concern on the part of civic leaders. All foreign armies traditionally are unpopular. The hope was that the Americans would not become unwelcome guests. As the embodiment of the United States to the people of Italy, SETAF has a great responsibility to put the nation's best foot forward. In everything that was done - on duty, in garrison, in the field, or during periods of recreation - the soldiers were the object of great interest on the part of the host nation. However, two factors assisted materially in turning this fact from a liability into an asset. First is the professional attitude of the SETAF troops and their Italian counterparts. The American soldiers are justly proud of their advanced and unique armament, their combat readiness and high state of training. They are glad to demonstrate their skills to the appreciative and interested Italian Army. The Italians, on their part, have had many a SETAF soldier as a guest at installations of the famed Bersaglieri or Alpini. SETAF troops attend courses of instruction in the Italian Alpina warfare school at Aosta where they learn skiing and mountain warfare at an institution that has no peer. In fact, several Americans have been successful in earning the coveted Alpini hats. Italian Military Police, the famed Carabinieri, have a unit on duty as an integral part of the SETAF organizations. They greatly assist the Americans by guarding installations, escorting motor columns, and sharing in the conduct of honor guards and other ceremonies. American Military Police and Italian Carabinieri share in the control of United States and civilian personnel in their off-duty contacts. The end-product of this close cooperation is a completely professional attitude and sense of harmony between SETAF and the Italian Army units that it supports. A second and equally important factor is the feeling of good will which exists between the Italian populace and SETAF personnel. This is no mere arrangement on a command or diplomatic level. It has its beginning and its authenticity in the grassroots. Being small, SETAF has no large executive-type community relations organization. Instead, it encourages an interchange of acquaintances and goodwill which, in two years has generated a healthy climate of mutual respect. SETAF has no "American Village" housing inclosures. American families live among the citizens of Livorno, Vicenza, and Verona, and the soldiers find their off-duty recreation in the local Italian community; often they visit with Italian families in their homes. The ever-generous nature of the American soldier has also contributed materially. Practically every battalion and separate company has, on its own, assumed sponsorship of orphanages or hospitals. This inborn friendliness that characterizes American soldiers everywhere has turned previous misgivings into an unqualified welcome and has served to disarm the skeptics among the local population. Disciplinary problems have been carefully controlled. By prompt official action and complete cooperation with the Italian authorities, the effect of infrequent incidents has been minimized. The Status of Forces Agreement between the United States and Italy has served as the basis for legal contact between the two nationalities. Its sensible and sympathetic application by both countries has assisted greatly in smoothing the rough spots that occasionally arise in any command. American personnel have actively participated in the everyday community activities. A Sergeant First Class in Verona is the coach of Verona's own Italian baseball team. Last year, SETAF's baseball team played against the Italian team of Florence in Italy's first night game. Joining in the local scheme of things athletically, SETAF soldiers have enthusiastically adopted soccer. This game, which enjoys an enormous following in Italy, is unfamiliar to most Americans, but SETAF troops learn it and play it. Needless to say, the American teams are usually soundly defeated by the more experienced and adept Italian team. Nevertheless, the seeds of friendship are sown. Games may be lost but friends are made. SETAF constantly extends every effort to cooperate with its Italian ally in every possible field - military, cultural, social, and economic. The daily life of the SETAF soldier is based upon attitudes and actions designed to accomplish this objective. The citizens of the Veneto district are thus becoming acquainted witha third generation of Americans whose parents and grandparents they knew in the two World Wars. The essence of the North Atlantic Treaty Organization is the voluntary mutual assistance of the signatory powers to build up strength collectively - a task which would be beyond the power of any one, singly, to achieve. The voluntary mode of this exchange reflects the great difference between the Free World and the Communist way of doing things. Anyone who would understand what SETAF is must understand the community relations phase of its existence, for this is what gives substance to the NATO idea. SETAF feels that the power of human understanding is greater than any atomic force. As a result of the emphasis on community relations, SETAF, while furnishing atomic-capable fire support to the Allied Land Forces of Southern Europe, is at the same time writing a new chapter in the historic friendship between Italy and the United States. The Army of tomorrow will be required to deal in the economy of small, compact forces, the common sense of measured, precise firepower, and the strategic and tactical adaptability of mobile, independent task forces. Such forces may have to be stationed in extremes of climate and terrain, far from the shores of the United States and far removed from the highly organized theaters of operations as they have previously been known. Through two years of valuable experience, SETAF has learned that the U.S. Army is quite capable of adapting itself to meet the challenge of the future. This experience has shown that small independent atomic forces can be employed and sustained for indefinite periods in foreign lands working in close support of indigenous forces. 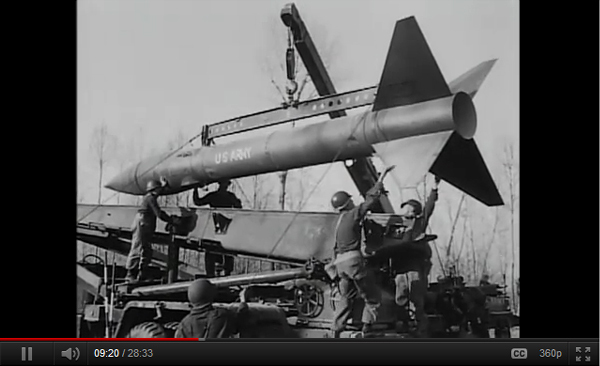 The American soldier quickly responds to training in the armament of the atomic age. Likewise, when well informed, he readily subscribes to and takes cognizance of customs and standards of conduct that make possible his living in harmony with those who will be his allies during war. Today SETAF's life in Italy is one of constant change. Its troops are engaging in alerts, field problems, and NATO combined exercises, returning to critique, revise, and retrain where deficiencies are indicated or where experience has shown that the mission can be accomplished in an improved manner. In this process, SETAF is confident that, as a small pilot unit, it is making important strides toward a tomorrow that is here today. SETAF - The Southern European Task Force, the Army's first overseas missile command, has completed its fifth year as integral link in NATO's European chain of defense in Italy. 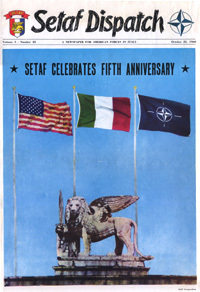 SETAF was activated in Italy on October 25, 1955 as a prototype combat-ready, atomic-capable support force. A Bi-National Italo-American missile command, SETAF has its headquarters in Verona. From there, the command directs the activities of the 1st US Army Missile Command and III Italian Missile Brigade in Vicenza; the 8th Logistical Command in Leghorn; and the SETAF Special Troops in Boscomantico and Verona. The 1st Msl Comd, under the command of Col Robert E. Coffin, is a streamlined organization with a potent punch. Highly mobile Corporal missile units, which furnish devastating power, are supplemented by engineer, signal, quartermaster, ordnance, medical and transportation elements. 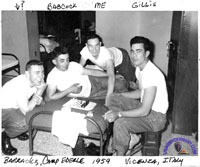 A major step in welding SETAF into a Bi-National Italo-American command took place on January 10, 1959 when 44 selected Italian artillerymen moved into Camp Ederle at Vicenza to start familiarizing themselves with Honest John rocket. For 55 days they trained and lived with the 77th FA Bn. Eight weeks later - at 1021 hours on February 25, 1959 - on the shores of the Adriatic, the Italian soldiers made history by firing the first heavy rocket (the Honest John) in the history of the Italian Army. On June 10, 1959, under the command of Brig Gen Alberto Orlando, the III Missile Brigade took over the complete operation of the Honest John rocket, thus becoming a part of SETAF. On October 1st this year, Brig Gen Giovanni De Gennaro replaced Gen Orlando as Commanding General of the III Missile Brigade. Another step in further welding SETAF into a Bi-National Italo-American command took place last April 1st when the first two Italian Army officers joined its staff. Since then, five more Italian Army officers have been assigned to SETAF HQ. The Italian officers have been assigned to their new posts by the Italian Ministry of Defense. They occupy important staff positions and perform duties similar to their American associates. In Leghorn is the 8th Log Comd, commanded by Col Robert E. Holman. The 8th Log Comd has the responsibility of supplying the other SETAF elements over a line of communications that extends more than 220 miles from the port of entry to the missile units in Vicenza. While commanders have carved one the world's finest modern fighting forces into being, they have not neglected the troops' and dependents' welfare. The commanders have worked tirelessly to improve troop and family living and working areas. The opening of 1st Msl Comd's "Villaggio della Pace" (Village of the Peace) and a new US Army Hospital in Vicenza are two examples. SETAF officers, men and their families have worked hard to improve community relations. Through every day contacts at home and at work, a strong bond of friendship and understanding has grown between the Americans and their Italian hosts. That SETAF has been successful in this respect is evidenced by the numerous articles that appear continually in the Italian press, praising the command. SETAF is starting its sixth year with confidence and a pledge to continually improve its military role in NATO and keep alive the spirit of friendship that exists with its Italian hosts. I came across your website and thought I could help. I worked in the Post commcenter on Ederle from 1961 to 1964. I was first assigned to the 560th Sig Bn and then the Fwd Spt Gp. Had friends in 600th ASA, 575th Trans, 45th Fld Hosp, Det G (later 559th Arty), 1st Msl, etc. Major events I remember well: Berlin Wall, Cuban Missile action, Longarone destroyed when the dam broke. the assassination of Pres. Kennedy I never knew where the 105s came from but they fired every 30 minutes the day of the funeral. The motor pool for these folks was across the main road from their barracks which fronted on the parade ground. This was fairly close to the main gate. The Vicenza commcenter was a tributary station and not so busy, It was also, at this time, run by the 560th. This would change. 600th ASA Co. No one talked too much about these guys. As I look through my stuff I can sharpen the unit focus a little better. I also have a lot of photos both personal and those taken by Sp4 McIntyre who worked in the post photo shop. My printer is down but these will be on the way. I was stationed at Caserma Ederle, Vicenza, from 1961 - 1964. I came in as a trained 105 howitzer crewman, but they told me they didn’t have that many howitzers and I would be assigned to a missile battalion as they were pretty much the same thing. Ha! Later ended up in Hq & Hq, Fwd Spt Gp (FSG) as a Personnel Mgmt Specialist, then was billeted with the 575th Trans Co. Spent a lot of time at the education center. FSG was comprised of pretty much all the personnel who were administrators on the post. We had the people who worked in personnel, finance, the officers HQ, etc. and a few MP’s from the MP battalion next door. 575th Transportation company was separate entity, I just filled a bunk space there. My job as a personnel specialist was to maintain the TOE's (Tables of organization and equipment) for all the units on post. We also were there when the Green Berets were just starting to recruit and I helped administer their written test. Simultaneously the Army was looking for Helicopter Pilots to train for Viet Nam, offering a Warrant Officer rating for volunteering. We had the engineer battalion on the other side of us. We also had the competition marksmen billeted with us. When field exercises took place we remained on post and pulled all the guard duties. Important things that happened when we were there of course were the Kennedy Assassination and the landslide caused wave that went over the top of the Vajont Dam with around 2000 deaths. What I found interesting was that Vicenza was in the middle of what they called at the time, “the communist triangle” where the communist party had it’s greatest following. There were annual elections and we were not supposed to be in town during their rallies nor were we allowed to wear our uniforms off post. I haven’t seen it on your website but there was also a listening post for what is now the NSA on the base. The mission as was explained to me was that we were there in the event the “balloon went up” e.g. Russia invaded Europe and one of our main tasks was to close Brenner Pass. There were nuclear warheads stored in the nearby mountains. We were also trained in riot control as sometimes the Italians would protest the nuclear presence. Q: Was the FSG a battalion-size structure and did it have any units attached to it? Also, was it just responsible for Vicenza or did it have detachments in Verona or Leghorn? Answer: No, I don’t think that FSG was a battalion-sized unit, more like a company. Our commanding officer was a Captain and we probably had 70 to 100 people. No units were attached to it that I know of. We did not have detachments in either Verona or Livorno (Leghorn). I just remembered that we also had the Armed Forces local radio station guys in the group. A friend of mine was assigned as a transportation specialist in Milan. His job was to go to the train station and ensure that arriving and departing troops got on the right trains. He had a great duty as they gave him money for an apartment in Milano. 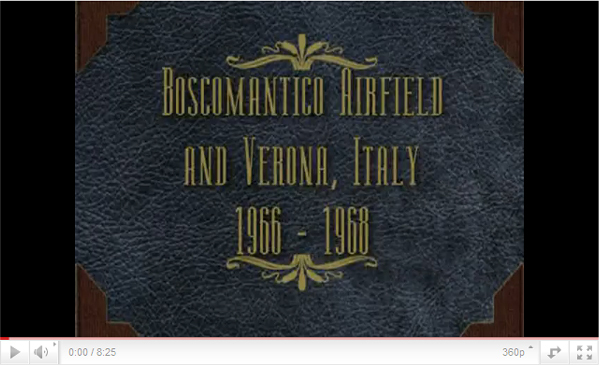 I was stationed in Vicenza, Italy from 1958 to 1960. I served in the 62nd Engineer Company. The Company was made up of men from the (former) 25th Engineer Battalion when they broke it up and was reducing the amount of men at this installation. Our company Commander was Capt. 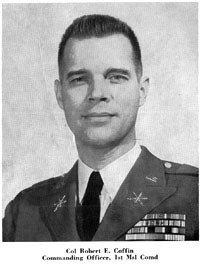 Richard W. Brown. I have another member of the survey group in Jacksonville, Fl. I live in Lake Worth, Fl. I wenr over in August of 1958. They had just started reducing the forces at the post in Vicenza. I went to (I believe) the 25th Engineer Battalion and had barely settled in when they broke up the Battalion. That's when they organized the 62nd. I helped carry things across the parade field to our new home. They sent most of us in the survey unit to Mathematics School for about three weeks to a month to learn log-a-rithms and then they sent us to Murnau, Germany to Survey School. We were up there about a month or two. I think my MOS ended up being 820.10 topographic survey computer. I left for the States in August of 1960. Just went back into the USAREUR Units - SETAF site. I don't know how I missed the SETAF designation in the left column the first time, but did open it this time which on Page 1 listed the 62nd. That took me to the info submitted by Bill Sedwick, who was there when I and Joe Stein arrived. I paid special attention to photos 3, 4, 5 and 6 on Page 9. Photo #3 was of the 2 & 1/2 ton that we built a shelter on to use for a computer operator location. This is before computers as we know them today, as all the work was done with slide rules, charts & hand-written forms. When the survey platoon was disbanded, several of use went out to a local disposal site and took it apart. Lumber being at a premium in Italy, it didn't take long for the lumber to disappear. I don't know if Bill ever learned what happened to his unit but I hope he understands what had to be done. When it was built, it was sort of his pride and joy. It was however, not SOP and I doubt if the command would allow it today. Photo #4 has 8 members of the Survey Platoon, the photo was taken behind the barracks of the 62nd. Back row, L to R are: Roger Hearn from Oregon; Duncan (can't remember his first name) from either North or South Carolina, I don't remember which; Bernard (Buzz) Boyer from Maryland; Joe Stein from Pennsylvania; Fred Chink, also from Pennsylvania and front row, L to R: Charlie Boyer (brother to Buzz); Milford Dube from Maine and lastly, myself who, because of the pronunciation of my last name (Killonen), was referred to as 'Killer" by our 1st Sgt. Photo #5 is of four members of the platoon that were also there when Joe & I arrived. The one on the left, who Bill was not sure of his name, was Southerland (or maybe Sutherland) but I don't remember where he was from. In photo #6, I don't know who Stewart was, so he must have been with the 25th and either didn't become a part of the 62nd or else transferred out before I got there. Looking at photos 3, 4 & 5 brought back more memories of stories associated with them and made me realize that I must put myself to the task of putting all of them on paper before they are lost forever. I was a member of the Topographic Survey Pltn of the 62nd Engr Co from Dec 1959 to May 1962. Had 66 days and a "wake-up" when the Berlin wall went up. Extensions took me all the way to ETS. I and another fellow, Joe Stein from Pennsylvania were the first two Ft. Belvoir trained topo surveyors to arrive in Italy. The platoon was made up of Artillery surveyors from one of the Artillery units on post. Spent probably 50% of my tour on surveys from Vicenza to Udine to San Candido and Bolzano back to Vicenza. Loved all 2 years, 6 months and 5 days I was in Italy. Have a ton of "war stories" about those years. It did my heart good to find a listing for the 62nd, but I'm sure it is no longer there. I attended high school in Tioga, the Oil Capitol of North Dakota. I'm sure you have read about all the new work being done there with the finding of the Bakken formation and now another formation found below the Bakken some two miles down. In the 50's, Tioga was a 'boom town' such as you see in the movies. Tioga went from a population of less then 1000 to over 2500 in about a year. When we arrived in early '54, the Main Street was dirt and gravel (you know what that was like after a rain storm) and there was even a hitching rail still standing in front of the old bank building. Well, three days after graduation, I and four of my classmates were on the way to Fargo for our physicals for the Army and then we were on our way to Ft. Leonard Wood, which was referred to by many as Ft. Lost In The Woods, Misery. After Basic Training, we all went our separate ways: one returned to Leonard Wood for his 2nd 8-weeks, two went to Aberdeen Proving Grounds for mechanical training, one to Ft. Gorden and I went to Ft. Belvoir in Virginia. After about two weeks of Basis Combat Engineer training, we started Topographic Survey classes with instruction in all aspects of Topo Survey. Back then, the basic instrument was the Wild T-2 plus the Military Level, Plaintable (or was it Planetable) and Stool Taping, which is just above the Chain and Pins for accuracy which was used by Artillery Surveyors. In addition, we had one day with the Telurometer, which was an electronic distance measuring unit using a Master Unit and two Remotes. These were just coming into use in the Army and could measure distances based on line-of-sight and could do the job in about two hours. After graduation, assignments were made with the rule-of-thumb being that the number one graduate was assigned to Germany which was considered the prime duty tour. Out of a class of about 25, I was number 7 or 8 and Joe Stein was number 17 or 18 and we got orders for Italy. The rest of the class went to Korea! Beats me how we drew the luck to end up going to Italy rather than Korea. We didn't complain. Even though Korea was a one year tour and Italy was for two years. After a couple of weeks at Ft. Dix, we lucked out again and ended up on a flight to Europe on an airline that was on contract to the military. Flew out of McGuire AFB (my FIRST time to fly), with stops in Gander, Newfoundland; Goose Bay, Labrador; Prestwick, Scotland and then on to Frankfurt, Germany for two or three days for more paper-work. Landing at Goose Bay, they blew a tire on the aircraft so we were stuck there for several hours. In DECEMBER! Prices in the lunch-room were out of sight. A cup of coffee was 50 cents and this was in 1959. Coffee in Tioga was a nickel with no end to refills. Our next development came half-way across the Atlantic when they learned there was a strike at Shannon, Ireland where we were suppose to land which put us into Prestwick instead. After our brief stop in Frankfurt, we flew to Milano where we boarded a train for Vicenza. Our railcar was reserved for the Army but an Italian couple ended up with us and when the Conductor tried to get them to leave, we wouldn't allow that and we, with our little English/Italian dictionaries, 'talked' with them all the way to Verona, where they got off. When we arrived at the 62nd, we learned that the Survey Platoon was out in the field on a survey and wouldn't return for about a week to ten days. Which left Stein and me with nothing to do but tour base during the day and then go into town in the evenings. When the platoon returned, we learned from the Platoon Leader that the platoon was made up of Artillery Surveyors obtained from 1st Missile Command on Post and Stein and I would be training them in Topo Survey methods. Even the Platoon Leader was an Artillery officer. Needless to say, this was going to be a real exercise. Our first survey was several weeks later when we went somewhere up north into the Alps, setting up on a river bed. I'm sure you've never had to dig a latrine along a rocky river bed, in the winter. And set up hex tents, heated by gasoline fueled Yukon heaters, atop snow that was a couple of feet deep. After several days the heaters had melted the snow to the point where we were down to solid ground. After some 'training', we went out to do some 'survey' work. The first order of business was to establish a 'base-line' so we could do some triangulation work. The Lt. found a spot to establish the 'base-line' (the snow was about four feet deep) and he went to an Albergo which was just across the highway and told us to let him know when we were finished. The Lt. had us find a rock which was about the size of a bowling bag, dig down in the snow to bear ground, set the rock and with a 'star' chisel, set that as our starting point. Then, using a chain and chaining pins, we set out measuring for several hundred yards to establish the other end of the 'base-line' where we set another rock (after digging another hole in the snow) and then began the task of taping back to our starting point. Now, for the 'base-line' to be acceptable, the two distances have to be within a certain margin of error between the two measurements or a third run would be required, maybe even a fourth. As we neared our starting point, I mentioned that I hoped the two distances would be good enough. Our party chief said not to worry, because they were going to work. So, out came the famed Army 'M1 pencil' and we were within two or three millimeters with the two readings. Then, out came the range poles to set up on one end of the 'base-line' with the T2 on the other end and we sighted on what only could be described as a 'dark spot' atop a peak about 1000 feet high on the other side of the valley. After turning angles from both ends of the base and shooting the vertical angles, so ended our survey. Later, we commented amongst ourselves that when the Spring comes and the frost goes out of the ground, those rocks were going to be moving to new locations. During the following months, several members of the platoon rotated back across 'the pond' to the land of 'round door knobs' to the land of the 'big PX', the United States. And we started to receive Topo trained replacements, sometimes two at a time. And then we really hit the big time when we were assigned a Drexel Institute Graduate who not only went through Topo training at Ft. Belvoir, during his DIT years had been on a survey crew for the B&O. We now had an Engineer Lt. in charge. The Lt. put things in motion and we ended up with a Master and two Remote units of the telurometer along with much needed additional equipment. Now we were ready to survey. There was a 1st Order 'base-line' on an old WW2 airbase (now abandoned) near the city of Udine in NE Italy. There we began a 'chain of quads' which would take us north into the Alps. Because there was a rather difficult spot at Spilimbergo, we were going to need assistance which was supplied by a couple of survey parties from the 656th Engr. Btn. out of Germany along with their equipment which included a Bilby Survey tower which could be erected to a height of 113 feet or less if needed along with the crew of two who were trained in such duty. A CWO, who was a real pro on survey work was their leader. The Bilby tower was set up in two locations and in all the angles turned off them, they never got a 'busted' angle. The 'chain' of quads took us up the valley through the Cortina area and north to the Dobbiaco/San Candido area. While in that area, we had to establish a point quite high in an area just to the SE of San Candido. Our survey party took a Jeep up the trails winding around looking for a place when we spotted a perfect spot. The place had a stone marker about 3 feet high and maybe a foot square. Perfect. We had no sooner gotten set up with our equipment when we heard a noise that kept getting louder coming from the east of us and getting closer and closer. The next thing we knew, a helicopter, which did now have either Italian or US markings on it appeared and landed near where we were. Out came two or three troops, carrying automatic weapons. We were trying to establish a survey point right on the border. We were lucky. After about a half-hour of trying to communicate in two or three languages, they let us leave with the understanding to stay away from their country. Another tough spot to handle was establishing stations to the west of Cortina, south of Dobbiaco and south and east of San Candido. Our survey party occupied a station atop Croda di Baranchi (probably spelled wrong) which was south of Dobbiaco and was the highest point of any station we occupied in Italy. I forgot to mention that all of our work was done at night shooting at 5 inch sealed-beam lights. Rising heat waves cause to much distortion during the day. And sealed-beam lights were DC so they would emit a steady beam, while AC bulbs flicker. While we were occupying the three mountain stations, the weather would now cooperate. When one station was in the clear, one or two of the others were clouded to the point that nothing could be done. That went on for 8 or 9 nights. The night of the storm, I was sitting on my bunk writing a letter. Out of nowhere came a bolt of lighting which struck the steel survey tower over the point we were going to shoot from and it lit up everything to the point that I could see the mountain to our west, which was about a mile away, through the walls of our tent. And then came the rain, the hail and the snow, all at the same time. Had our tent not been tied to the steel tower, we would have lost it. We started to get a call on our radio from the station near Cortina but all I could do was tell them that we were in the mother of all storms and not to call us, that we would call them. The storm raged for 15 or 20 minutes and when it finally let up a little, we tried to call the survey party to our SE to warn them of the storm but they were asleep and when it hit them, their tent went down. They got soaked. We went outside to check things out and it was then that we got to experience St. Elmo's Fire. There were three wires sticking out of the top of the steel tower at our station and they were glowing like a light bulb with a really beautiful shade of blue. Then antenna of our radio, which was sticking out the top of our tent was also glowing. And every time a bolt of lighting out hit, as the storm moved away from us, it felt like fingers running through our hair and all the droplets of water on our uniforms would also glow with the blue light. That was enough for us. We went back into the tent. After the storm cleared, all three stations were in the clear and we began to crank angles. We worked until daybreak, slept all day and then cranked angles all the next night. After that, our survey took us west to the Bolzano area where we set up a base camp for several weeks, working our way down the valley toward the Verona area and then east to Vicenza. In addition to the 'chain' of quads we also did a number of open ended and closed traverse surveys. All of this work was done over an almost two year period, two and three months at a time. When things began to wind down and they were getting ready to disband the survey platoon, I was fortunate because I had two things in my favor: I had a US and NATO Secret Clearance AND I could type. So instead of getting transferred to an Artillery units survey platoon, I became the clerk-typist in the company S2/S3 section. There is more, like base camping near Aviano AFB, the time one of our platoon rolled a gasoline trailer which destroyed a duece and a half and several hundred feet of highway, another guy rolled a Jeep on a mountain trail and the time an H34 chopper was crashed, luckily without loss of life, at a mountain station. But that will have to come later as I have to get things ready for work in the morning. I hope I haven't bored you to tears. I wish I had had some Vecchia Romagna to enjoy while I was running through my memories. Also, as you can see, because I'm not learned enough about the net yet, and I wanted to save this so later I don't go over old ground again, I'm going to also attempt to send this to myself. I just hope I don't loose the whole thing. The purpose of the surveys was to support 1st Missile Command's mission in Northern Italy. We always told people that our job was to establish points around the Alps to verify the accuracy of maps that the military used in day-to-day operations. It was a very narrow scoped operation. 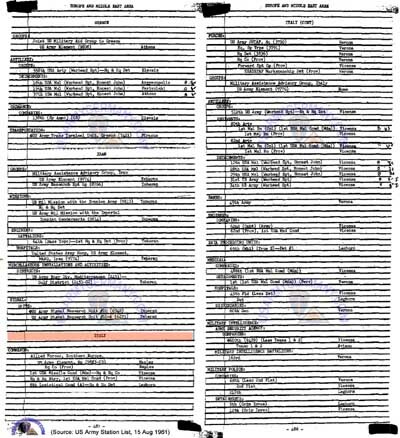 Also, the 62nd, which, by my checking for info, appears to no longer exist, was an ADM company with three Demo platoons. Their mission was to fly items to the Brenner Pass, in the event of an attack from the East and destroy it to prevent entry into Europe from the South. We then would pull back and act as a delaying force to allow Germany and the rest of main-land Europe time to prepare. Just before I arrived in Italy, the Army had turned all of the Honest John rockets over to the Italian. To best describe the Honest John is: 'I shot an arrow into the air. It fell to earth, I know not where' which was the main reason that 1st Missile had been outfitted with the new Corporal missile which had a guidance system. As I was rotating back to the US, the Corporal was being replaced by the Sergeant missile system which had a greater range and was much more accurate. All this reminded me of another item of interest in relation to the 62nd and their ADM mission, which I will go into more detail next time. Reference my earlier mention of the 656th out of Germany, if you have contact with anyone that served there 1960 to 1962 and was a member of the survey platoon that made the trip to Italy to help the 62nd, please send them my email address so they can get in touch with me. 69th Ord. Co. left Fort Bliss with other companies, and left N.Y. on Sept. 7th, 1956, aboard the USS Gen. William O. Darby. (A trip I would like to forget). The 69th Ord. Co. was billeted at Casermo Chinotto in Vicenza, Italy. Our function was to maintain security at a site outside of Vicenza - where the Corporal Missile was stored/assembled. (The name of the site escapes me.) There were three guard towers on the high ground, plus perimeter security. The 69th was also in charge of ingress, and egress through the Badge Registration Office. The 69th was kept out of the loop regarding missile site information. Most of our Co. left June, July, 1958, and was sent back to the U.S. for discharge. I understand that as far as military records are concerned, the 69th never existed. We were just a blip on the radar screen. Camp Chinotto was turned over to the Italian Govt. around 1959. Pretty good copy..... not like today's FAX, but that was 50 years ago. Very slow.. realize that in those days even 600 baud over a switched network was unheard of.. but it was on the horizon. 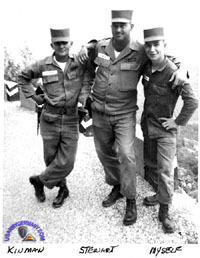 Hard Chargers - Official web site of the 30th FA Regiment Association, including 2nd Bn and 5th Bn, 30th FA (Sergeant) that served in SETAF in the late 1960s-early 70s. U.S. Army Africa (formerly SETAF) - Official web site. History of Camp Darby - Only one of a handful of official US Army websites that takes their command history seriously. Lots of information and photos. Good job! Keep it up.